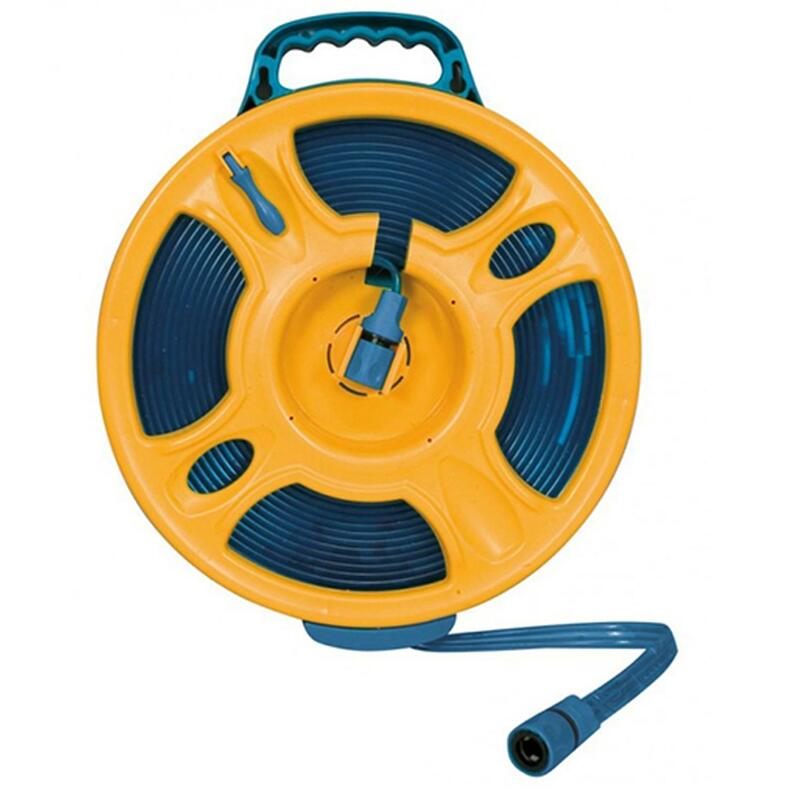 This Brunner flat hose on a reel is perfect for extending your connection at the campsite to your caravan or motorhome and perfect for connecting to the site water supply. 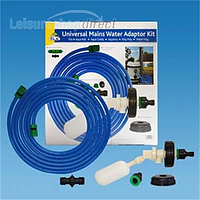 It is also ideal for refilling on-board water tanks. 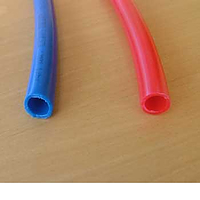 The flat strong hose need not be unwound fully to be used and comprises of a triple chamber system. You can simply pull a metre off and it will work just as well! 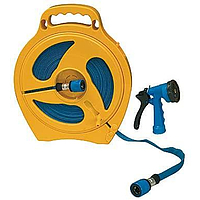 Brunner Hose reel with new food quality flat hose,stores flat in its own easy-winding reel. It is lightweight and easy to store. Complete with quick connectors and 4 position spray head. The Bruner hose and reel is excellent to store and quickly in reel to fill the water tank on my Motorhome and takes up very little room, perfect for the job. 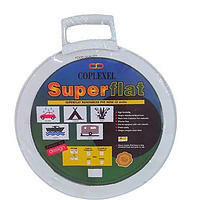 This item was bought for our motorhome as it takes up less space and is easy to use without tangles or kinks. It would have received a 5 star rating had the nozzle been a non-return valve as you have to risk the splashes when removing it from the plug in the filling point on the van or the tap at the other end. Works very well, lays flat on the ground in use. Initially stumped by the hose connector on the non-tap end, but helpful people at Leisureshopdirect helped me sort it out. Not used yet but looks far superior to any other hose I have previously used. Does what it says on the tin! 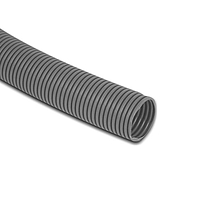 Its big advantage is that you only need to unroll the required length, not the whole thing, which means you don't have piles of unnecessary hose looping around your feet. The downside is that, as other reviewers have mentioned, its flow rate is quite slow - it took me 27 minutes to fill a 90L tank from empty so you won't be popular with queuing motorhomers at the single on-site MoHo service point...! It would also be improved if at least one of the supplied couplings was a 'stop' one which stops the water flow when uncoupled. True, you can add this yourself but to my mind its an obvious omission. 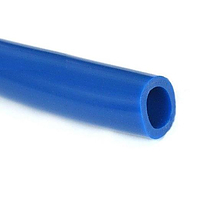 This hose is easy to use & you don't have to unreel it all to use it & it doesn't kink. I bought it because a colleague of mine has one. It's the best hose I've had. Does as it says on the packet. Would have said 5 stars but it's a bit slow due to small internal diameter of hose sections. Splendid design and space-saver at an excellent price: cannot fault it. Does exactly what it says. The hose seems durable but not so sure about the cassette and the flow is obviously restricted by the design. 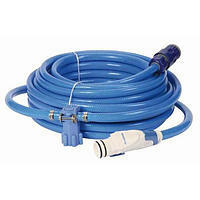 It will be very useful only having to unroll enough to reach the motorhome from a tap and the hose looks strong. The reel could be sturdier though. The hose is stiff plastic and escapes from the sides of the reel instead of winding in or out smoothly. Probably good value for the money though, as it seems better than the cheap green ones and is less expensive than many of the better ones. Just what I wanted. 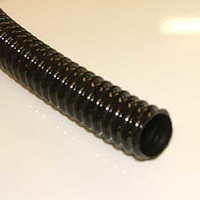 Say goodbye to rolling up a normal flat hose and spending time getting all the kinks out. This does the job with no need to unreel any more than you need. Flow rate is fine and this has eliminated all the hassle I had before with conventional hoses. Recommended. This Brunner hose is great. Bought for the motorhome and it does exactly what we want without having to unroll fully every time. Light and tangle free easy to pack away after use. Stores well. Does what it should. Innovative solution to the old problem of roll flat hose. No need to roll out the complete hose but just a much as you need. No swivel joint on the reel so no leaks which is important if using with the Aquaroll ball valve and the water is left turned on. 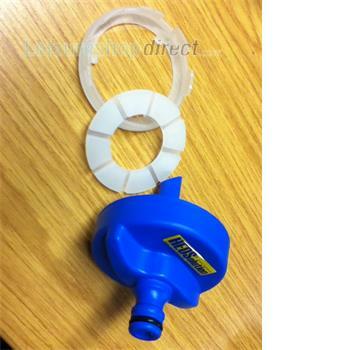 This Brunner Hose Reel With New Flat Hose will be very handy in the motorhome. Easy to store,neat & tidy.